Azerbaijan intends to review the Belarusian experience in regulating waste management and developing a system of specially protected natural areas. 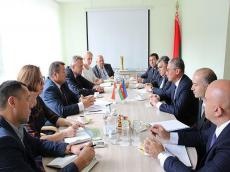 This and other issues were discussed at the meeting of Minister of Natural Resources and Environmental Protection of Belarus Andrey Hudyk with Ministry of Ecology and Natural Resources of Azerbaijan Mukhtar Babayev. Babayev arrived in Belarus on a working visit to review the state administration of environmental activities in Belarus, experience in regulating waste management and developing a system of specially protected natural areas. At the meeting, Hudyk noted the expediency of developing cooperation between the environmental authorities of the two countries in the field of hydrometeorology, as well as in the field of geology, exploration and development of mineral resources. As a result of the visit, the parties plan to sign the program for 2018-2019 to implement the agreement between the mentioned ministries of the two states in the field of environmental protection. Diplomatic relations between the two countries was established in 1993, but cooperation in the economic sphere has been developing dynamically over the past decade. Azerbaijan’s first ever Trade House was opened in Belarusian capital Minsk this May 26. Trade turnover between Azerbaijan and Belarus amounted to $147.7 million in 2017, according to National Statistical Committee of the Republic of Belarus.